I have been in money saving mode lately. Recently we switched strictly to cash and lowered our budget when it came to food. After looking at places we could make cuts in our life, food seemed to be where it was most needed. This was our first month of trying it this way and so far so good. We've cut our food costs by $100 a month so far and I keep finding new ways to save. 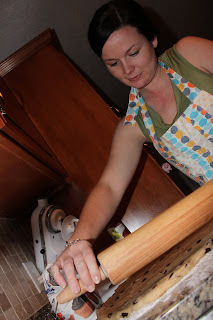 One way is making our own Raisin Bread. Sometimes you can find it on sale 2 for 5 which is a good price...most of the times though it is around $4.19 a loaf. This recipe lets me make 3 loafs a batch which is just about enough to last us a month. I just simply freeze the extra loaves and take them out when we need them. It's quite a process and does take up a lot of time, but it's not too bad when you only have to do it once a month. I found this recipe on recipezaar.com and read all 95 reviews. I went against my normal rule of always trying a recipe as written first and went ahead and made some changes that were suggested from other reviewers. 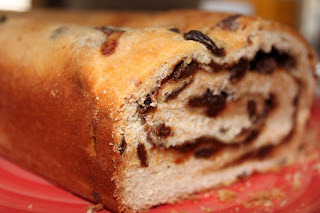 It's not my normal Sunmaid Raisin Bread, but it's a keeper. 1. Warm the milk and raisins in a small sauce pan on the stove until it just starts to bubble, stirring occasionally. 3. Let cool until lukewarm, about 120-125 degrees. 4. Dissolve yeast and 1 tablespoon sugar in warm water and set aside until yeast is frothy, about 10 minutes or so (make sure your water is at the correct temperature or the yeast won't activate.) Then mix in eggs, sugar, cinnamon, butter, salt and 2 1/4 cups raisins (stir in the cooled milk slowly so you don't cook the eggs.) FYI - the butter looks funky, like it won't mix in...the kneading will take care of it. Add the flour gradually to make a stiff dough. 6. Place in a large, buttered, mixing bowl and turn to grease the surface of the dough. 7. Cover with a warm, damp cloth and let rise (I like to let my bread rise in the oven with the light on. It has just the right amount of heat and keeps the bread out of drafts.) Allow to rise until doubled, usually about 1 1/2 hours. 8. Roll out on a lightly floured surface into a large rectangle 1/2 inch thick. 9. Moisten the dough with 1 tablespoon milk and 1 tablespoon melted butter and rub all over the dough with your hands. 10. Mix together 2/3 cup brown sugar (packed), 2/3 cup white sugar, 1/4 cup cinnamon and 3/4 cup raisins and sprinkle mixture evenly on top of the moistened dough. 11. Roll up tightly (the long way). The roll should be about 3 inches in diameter. 12. Cut into thirds, and tuck under ends and pinch bottom together. 13. Place loaves into well greased 9x5 inch pans and lightly grease tops of loaves. 14. Let rise in a warm place, uncovered, again for about an hour. 15. Bake at 350 degrees for 30 minutes or until loaves are lightly browned and sound hollow when tapped. 16. Remove from oven and let cool on rack. 17. Take melted butter and spread over tops of loaves. 18. After about 20 minutes, lay loaves on their sides and remove from pans. 19. Allow to cool before slicing. 20. To freeze...let loaves cool overnight. Place in ziplock bags making sure to squeeze out all the air and date them. They can be frozen for 1 month. Let thaw overnight in the fridge and reheat in the oven.